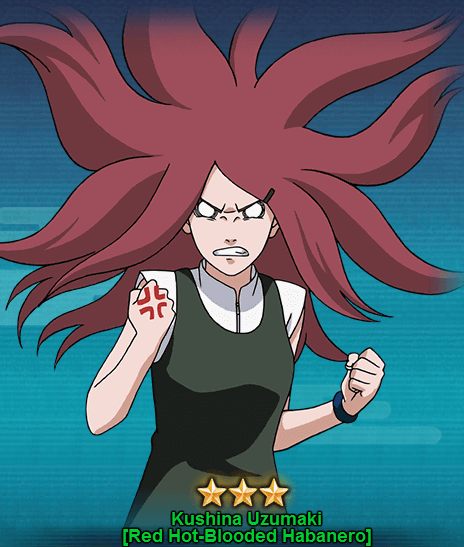 As we have covered about the normal Kushina Uzumaki in another article, we will directly go to the abilities of Kushina Uzumaki [Red Hot-Blooded Habanero]. This ninja character is more powerful compared to the normal Kushina Uzumaki. Taijutsu & Ninjutsu Sealing Jutsu – Adamantine Sealing Chains [Prompt]: Causes damage and Paralysis to up to 3 units of the opponent’s team and Suppresses All Immunity to Debuffs until the end of the round (At this time, if the opponent recovers its Immunity, it will cancel all of its Debuffs). Causes Repulse to a selected opponent’s unit. Taijutsu Adamantine Chains: Attacks the opponent’s unit with the least Life points, causes Paralysis and has a chance of causing High Float. Taijutsu & Ninjutsu In the Name of Love: Chases and Attacks a Low Floated unit, causes Knockdown and Immobile. It will also cause a small amout of damage to this unit and the opponent based on this unit’s maximum Life points. Ninjutsu Tailed Beast Chakra – Wars: Before each action of a round, recovers Life based on unit’s own Ninjutsu attributes. Can be triggered up to 2 times each round. Become immune to all Debuffs.